For the past 13 weeks, I have run at least 3.1 miles on Saturday or Sunday (with one Friday thrown in there for the GLOW run) - either for official races or on my own. Me. Running, voluntarily, a 5K or more, every weekend. I've gotten up the last two Sundays and gone for a run - and these are my sleep-in days, people - I've been dressed, fueled up by both coffee and my athlete's candy, and have hit the ground running by 8:30 am. So weird. There are times when I still don't recognize myself, and it's not just when I look in the mirror...this whole "runner/athlete" deal is strange. For example, yesterday when I was running at the park, I passed some women who were walking their dogs, and realized that to them, I'm a runner. I'm now the person who used to pass ME. I'm now the one who I used to watch run by, thinking I'd never, ever do that. And yet, there I am. Wow. Oh, and guess what? My pace for my first mile was 9:27, which is really really fast (for me). I knew I was going fast - too fast, really, to keep it up for the entire run - but I felt good and it was just fun to be so speedy for a change. And this was running all by myself, with just my iPod to keep me company! 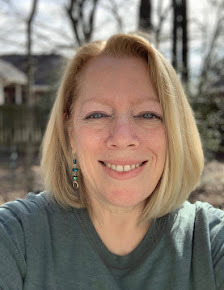 I was rockin' my 70's and 80's playlist - started out with Right Back Where We Started From (good stomping beat...no wonder I was running so fast), on to Rock the Boat, I Think I Love You (Partridge Family, anybody? ), Boogie Fever, Turning Japanese, Mexican Radio, Kung Fu Fighting, Why Can't We Be Friends, She's A Beauty, and finished the run, appropriately, with I Am Woman (go Helen Reddy!). 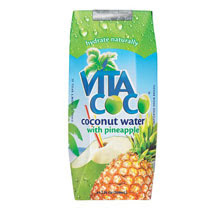 After my run, I had some VitaCoco water, which is really good - this flavor reminded me of Hawaii! Love the ingredient list: coconut water, pineapple puree, ascorbic acid (Vitamin C). Only 80 calories, no fat, low sodium...and a whopping 680 mg of potassium, which is great after sweating like a fiend...you know when even your wrists are sweaty that it's time to replenish! I'm looking forward to Tuesday morning, when I will run again - hopefully with Jenny, who will be back from vacation. But even if she can't run with me, I'll be out there, with iTunes playing and feet flying! If it were possible, wouldn't you just love to have one opportunity to go back in time, and have the "new" you spend some time with the "old" you. Just an half an hour. Let "her" see "you" now running and biking and working out. At the very least, to give her a big hug and tell her everything would be alright. The reason I say that is that I was looking at your little sidebar photos of May 2008 and 2009. (Me thinks you need a 2010 to add!) I just felt like it would be nice if the lady in the 2008 pic could have known or seen what would be surrounding her...a great fitness and health blog...written by you! I hope this made sense, or maybe I need more coffee! Yep, you are an athlete now. If the old you could see the new you now she would be impressed! WOW. What a great revelation. One day I'm gonna be like you and be zipping down the trail/sidewalk. What do you think the old you walking on the trail would say to the new you running on the trial? Would she recognize herself? You are simply AWESOME! Adult-onset athletics is all-consuming! Enjoy the freedom and the power! You're making me love running all over again! I know I'm on my way. I backed up my running program. I went back to 2/4 run/walk because I think I was just trying to get there too fast. So for today, I'll just watch you run past me. Knowing that some day, I may be able to keep up. Look at you the lickety split runner! There is a big realization that an athlete does not have to look like they stepped off of the cover of Sports Illustrated. It can be anybody at any time. You just have to do it. I know. I think about how my life has changed in the last year. Running a 5k used to wipe me out. Now that's just a run for me. I'm going to have to try the coco water. Hubby drink coconut water after he runs and I use it in smoothies. I have you tried the one with passion fruit? ((HUGS)) I'm so proud of you. WOW, that's a great pace too! OK, going to look for that coconut water. Where did ya find it? Oh I loved this post, and I loved some fo the comments too! And Debbie's description of going back in time and talking to the old me--that thought really intrigues me. I love Helen Reddy. And that coconut waterl--reminds me of a pina colada. I bet it would really perk up a smoothie. Wow! Way to go on your great run! You are a true inspiration to me. I hope to be a "runner" like you someday. That coconut water sounds yummy! I was initially going to say that you have a short playlist for a 3 mile run. But then I re-read the part where you clock in one mile under 10 minutes. Yowza. What a great Saturday routine! I stepped on the scale this morning and nearly had a major depressive episode (aka nervous breakdown) when I realized it said 259. How did that happen? When did it happen? I knew I had gained weight but that's 100+ lbs and somehow I'd not realized. Not really. Feeling overwhelmed I decided to search the internet to see if I could find anyone who's lost a hundred pounds. Low & behold I found you! OK. Deep breath. I am not alone. Great post!!!! Have fun with your Tuesday run with the wind at your back and your feet a flyin'! Have fun on your next run on Tuesday. I envy you.. Someday..
Love it!! I used to have Patridge Family on my iPod - think I need to add some back on! You go girl - anything under a 10 min mile is fast to me! Doing my first half-marathon this weekend, and I hope to finish averaging about 10-11 min miles! You Rock!! Great running, great time, great tunes! Shelley - that is an amazing first mile pace! You are turning into speedy gonzales!! Hannah had fun more at the afterprom than the actual prom - she said the food sucked and the DJ sucked - each ticket was $120 too! Fun playlist, you runner, you! I love coconut, so I'm gonna have to be on the lookout for that stuff. David Cassidy? Your boyfriend with the Paul McCartney hairbob. I'm not sure about that playlist. Well, I'm sure about it. The Vitacoco sounds yummy and I'll bet it is. But David only likes cola. I Think I Love You, Boogie Fever, Why Can't We Be Friends... Thank you for making me remember those great tunes. That is so cool that you've realized that you ARE the RUNNER at the PARK who passes the walkers. There is power in knowledge. Shelley, you need to take this show on the road. You are truly and inspiration and YOU ARE AN ATHLETE! We eighties girls :) Music was so much better back then than nowadays although I love some of today's music too. Yes Shelley, you're a runner and you've accomplished so much in 13 weeks. You have every right to be damn proud of yourself. I know I am! its tuesday morning but Im just reading this as I gifted me some techfreedays. you KNOW I am proud of you. and so longing to meet up and jog a few (ok perhaps youre jogging and im cheering?) in person. Hey there speedy gonzales...will you wait for me at the finish line?